Helix 7.0 introduces another long-sought feature: icon time stamping. Each icon has two time-stamped properties: Creation date & Modification date, giving the collection designer an automatic way to track changes made to a collection. This technote describes the time stamping mechanism and its nuances. When a new collection or relation is created, the Created & Modified columns are enabled by default for List Mode. The modification date column is displayed first in order, as that is likely to be referenced much more frequently. When a collection is updated to Helix 7.0, the Modification date column is automatically turned on for the collection and existing relation windows. The Creation date column is turned off by default, since the value there will always be undefined. An undefined date is indicated by a hyphen (“-”) character. Choosing ‘New Collection’ from the ‘File’ menu. Dragging an icon from the Element Panel. Choosing ‘New Icon ▸ …’ from the ‘Icon’ menu, or pressing its key equivalent. Applying structure that creates new icons. Changing the structure of icons via the graphic editor (and committing the changes). Applying structure that updates existing icons. Changing the structure of icons via AppleScript (and committing the changes). Any change that requires a ‘Commit’. 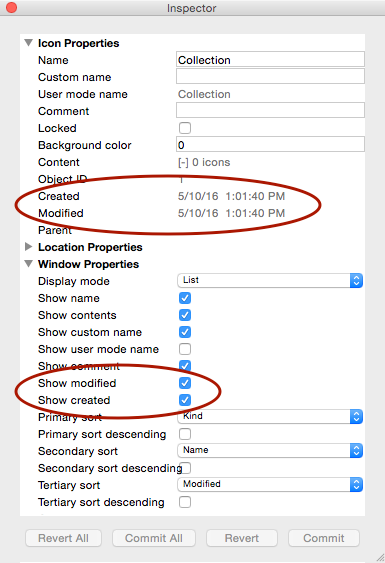 Modifying any icon within a collection also updates the modification date of the collection icon. Modifying any icon within a relation also updates the modification date of the relation icon. Changing a collection or relation’s position, view mode, displayed columns, or sort order does not update the modification date. When a relation icon is duplicated, its creation and modification dates are set to the current date, as are the dates for every icon within the duplicate. When an icon is deleted, its parent's modifiction date is updated. When applying structure, whether by copy/paste or by choosing a clipping from the © menu, the modification date timestamp for icons that are modified should be updated to the time the clipping is applied. Icons that are new to the collection should also have a creation date of the time the clipping is applied. We have a report that this is not working as intended, and are investigating. See R9316 in techdb for updates. Columns can be enabled and disabled, and their order rearranged, via AppleScript. See R7545: List Mode Column Features in Helix RADE 7.0 for details. A script that selects all icons modified after a specified date is available from our free AppleScripts page.